DUBUQUE — For a growing number of area Catholics, the universal nature of the church is not just an abstract concept anymore but is a flesh and blood reality they are witness to when they participate in their parishes. This is due to an increase in recent years in the number of priests from other countries serving in the Archdiocese of Dubuque. There are currently eight international priests in active ministry in the archdiocese, and one in retirement. Six come from Ghana, one from Nigeria and one from Myanmar. Father Louis C. Zee, who is retired, comes from China. These clergy are all “incardinated” in other dioceses around the world, meaning they were ordained for their home dioceses and serve under the authority of the bishops there but have been allowed to minister here with permission from their bishop and by invitation of the Archbishop of Dubuque. “What happens in most instances is there is a self-initiated inquiry or a request for placement by a bishop,” said Msgr. Thomas Toale, vicar general for the Archdiocese of Dubuque. In the case of Father Luigi Htyaruh (pronounced HEE-tar-ru) of Myanmar, however, the archdiocese specifically requested his help due to the special language and cultural requirements of the Burmese Catholic refugees who had settled in the Waterloo area. Having priests originally from other nations serving in the archdiocese is not a new phenomenon. Father Nils Hernández and Father Dustin Vu immigrated from Nicaragua and Vietnam, respectively. They settled in the United States permanently as young men. Father Vu joined his family who had escaped Communist repression, and Father Hernández sought asylum because of war in his homeland. They later entered the seminary and were ordained in Iowa. “Father Nils Hernández and Father Dustin Vu both came here and studied for the priesthood in our archdiocese,” explained Msgr. Toale. With the exception of Father Zee, who was ordained for the Archdiocese of Nanking, China, there weren’t many clergy incardinated in dioceses in other nations serving in the Archdiocese of Dubuque until relatively recently. Father Zee was ordained at St. Raphael Cathedral in Dubuque in 1959 for his Chinese archdiocese. He served in parishes in the Archdiocese of Dubuque from 1959-2000, and then ministered to Chinese Catholics in Texas before retiring there in 2003. In 1997, Father Francis Bashyam, a priest for the Diocese of Bellary in India, served as associate pastor at Nativity Parish in Dubuque for one year. Father Bashyam’s connection to Nativity began in the 1980s when Father Mark Ressler, a priest for the Archdiocese of Dubuque, sponsored his seminary education. From 2000-2012, there weren’t any international priests serving at archdiocesan institutions until Father Richmond Dzekoe began serving at a parish in April 2012. The priest, from the Archdiocese of Cape Coast in Ghana, came to the U.S. to study at Iowa State University (ISU). “Many times international priests are here to get education that isn’t available in their home countries,” said Msgr. Toale. In Father Dzekoe’s case, he began working toward a doctorate degree in applied linguistics and technology and asked if he could serve at St. Thomas Aquinas Church and Catholic Student Center, which is nearby ISU. This began a fruitful relationship between the two archdioceses in Ghana and the United States that led to other African priests serving in Northeast Iowa. International priests that serve in the Archdiocese of Dubuque follow a process involving the United States immigration system and the church. Once they receive permission from their bishops, these priests must pass international background checks before being placed into ministry. In most cases, the priests must go home after a specified amount of time, but there is opportunity for them to extend their stay when appropriate. Since 2012, the number of international priests in the Archdiocese of Dubuque, particularly from Africa, has increased significantly, with two new arrivals in just the past few months. Father Raphael Nana Andoh (pronounced NA-na AN-doh) of Ghana came in December 2016 to serve as chaplain at Mercy Hospital in Dubuque. Father Michael Hutchison also of Ghana came in November 2016 to serve as associate pastor at the Church of the Resurrection Parish, also in Dubuque. When possible, the international priests are given assignments close to each other, so they can have support and fellowship with one another, according to Msgr. Toale. They also often serve at Catholic institutions, such as colleges, universities and hospitals, where the archdiocese may have trouble filling the need for priests. Father Anthony Adawu (pronounced A-DA-wu), is a prominent example of this. The priest from Ghana began serving at Mt. Mercy University in Cedar Rapids in 2015. At the time of his arrival, he was the first full-time chaplain to minister at the school in about six years. He offers the Eucharist and other sacraments and teaches Introduction to Christianity and English as a Second Language courses. Before coming to Iowa, he served in the Archdiocese of Baltimore for eight years while studying at the University of Baltimore for a doctorate in curriculum and instruction, with a specialization in second language education. He is now completing a second doctorate in theology. The trend of international priests coming to the U.S. coincides with a decline in the number of priests nationally. According to CARA, there were 58,632 priests in the U.S. in 1965. That figure had decreased to 37,192 in 2016. Meanwhile, the overall population of Catholics has increased from 48.5 million to 74.2 million, according to a survey-based estimate. The increase in the number of international priests is helping to meet the needs of the faithful for priestly ministry. “They have all brought their unique gifts as priests,” said Msgr. Toale. He also emphasized that there is a strong effort to help more local men hear God’s call. “The welcoming of international priests does not at all minimize our efforts to increase vocations to the priesthood from our archdiocese,” he said. 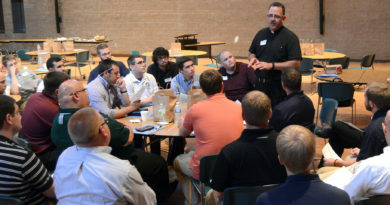 While acknowledging a shortage of priests nationally and in Iowa, Archbishop Jackels describes this situation as “temporary.” The energetic effort to encourage young men to consider the vocation uses a method embodied in the acronym PITA. It stands for: P-praying to know God’s will, I-inviting us to consider priesthood, T-talking about it and A-appreciating what the priesthood has already meant to us. So far, the effort is making some headway. Five local men will be ordained to the priesthood on Saturday, May 27 at 10:30 a.m. at St. Raphael Cathedral. This is the largest ordination class since 1989, when seven men were ordained. Msgr. Toale pointed out that in the wake of Vatican II’s call for evangelization, the Archdiocese of Dubuque sent its own priests to South America, starting a mission in Cochabamba, Bolivia, that operated from 1965-1986. He believes the reality that more priests are now coming from other nations to serve in this archdiocese is of mutual benefit. “They provide priestly ministry while furthering their education,” said Msgr. Toale. In his comments to the priests of the archdiocese at the 2016 Chrism Mass luncheon, Archbishop Jackels reflected on the essential importance of missionary activity to the local church, connecting it to priests from other countries serving in the archdiocese. Father Adawu is one of the international priests who embody this eternal, yet evolving missionary spirit of the church. From the West African nation of Ghana, Father Hilary Aidoo (pronounced A-doo) came to the Archdiocese of Dubuque nearly four years ago to serve in the archdiocesan finance office and was also appointed to assist as sacramental priest for St. Columbkille and St. Joseph the Worker Parishes in Dubuque. In his native Ghana, Father Aidoo had been the pastor at two different parishes before becoming the financial administrator for the Archdiocese of Cape Coast, a role he held for 17 years. In 2013, Father Aidoo began to explore the possibility of taking a sabbatical and thought he would probably return to the United States, to the Diocese of Brooklyn, New York, where he had served in the past for six years when studying at St. John’s University. But around that same time, Father Aidoo received a call from Father Gabriel Anderson, the pastor of St. Columbkille’s in Dubuque, who had just been assigned a second parish – St. Joseph the Worker – and said he could use the help of another priest. Father Aidoo agreed to step in to assist and soon found himself on his way, not to New York, but to Iowa instead. Father Aidoo said that while there are many differences between the United States and Ghana, the one that stands out the most to him, from a liturgical perspective, is the way Catholics in the two countries express themselves differently during the Mass. “The faithful in Ghana love to sing along with musical instruments – drums, organ and others – and express the joy of the celebration with bodily movements,” while Americans tend to be more low-key in their celebration, he said. Despite differences, though, Father Aidoo said fundamentally there is so much that is the same between the church in United States and in Ghana, and anywhere else in the world for that matter. Father Aidoo, who just celebrated his 60th birthday earlier this month, will remain in the Archdiocese of Dubuque until July, at which time he will return to Ghana. He said his almost four years in Iowa have been a positive experience. 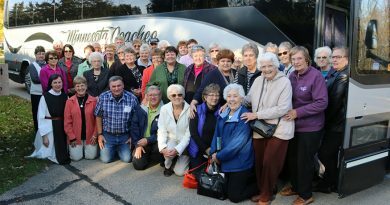 “So far, I am really enjoying my stay in both parishes and in the Archdiocese of Dubuque in general,” he reflected. “The people are very warm and welcoming. They always make you feel at home. Unlike Father Aidoo’s Ghana, where more than 80 percent of the people are Christian, and almost a quarter are Catholic, Myanmar, the home country of Father Luigi Htyaruh, associate pastor of Sacred Heart Parish in Waterloo, has only a small Christian population. In Myanmar, also known as Burma, nearly 90 percent of the people are Buddhist, while Catholics make up only about one percent of the population. In the face of persecution, many Catholics and other ethnic and religious minorities have left Myanmar, a country plagued by civil war and unrest for nearly seven decades, to be resettled in places like the United States. Currently, the U.S. receives more refugees from Myanmar than from any other country in the world, according to the Pew Research Center. A significant number of Burmese refugees have been settled in Iowa, in cities like Waterloo, where upon their arrival, many Catholic members of the Burmese population began attending Waterloo’s Sacred Heart Parish. 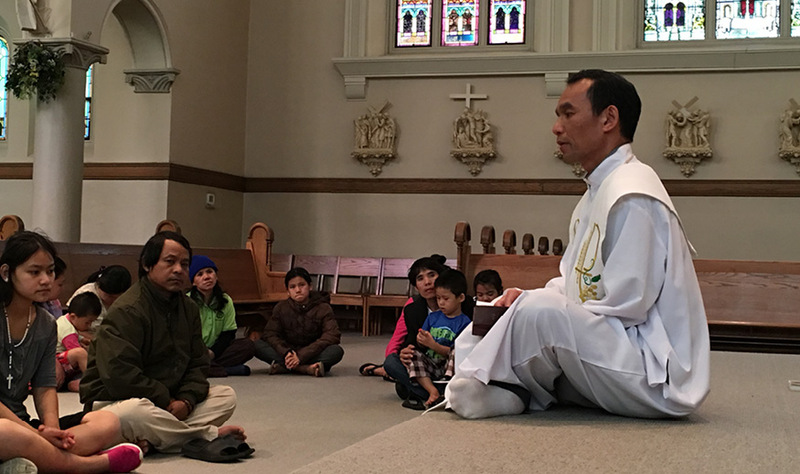 In 2015, with a growing Burmese population, Sacred Heart looked to find a priest from Myanmar who might be able to help serve the newest members of the parish community in their own language. Father Htyaruh, from the Loikaw Diocese in Myanmar, was recruited to help. He arrived in the Archdiocese of Dubuque in July of that year. Father Htyaruh, who finished his theology education in the Philippines before returning to Myanmar and being ordained in 2004, served at two different parishes in his home country before accepting the assignment in Waterloo. He said that many of the Burmese families that have come to Iowa in recent years, did so via a refugee camp in Thailand where they had fled to from Myanmar. Many of the families have a connection to a parish in the diocese in Myanmar where he previously served. Father Htyaruh said Burmese refugees have faced many challenges as they have left Southeast Asia and come to a new country, including often times a language barrier, a challenge he said he himself faced when arriving in the United States. Father Htyaruh stays busy tending to a flock that continues to expand in size. There are “125 Burmese Catholic families (491 members) in the Sacred Heart Parish,” Father Htyaruh stated. More than half of Sacred Heart School’s families are also Burmese. Though he may have come specifically to help with the Burmese refugee population, Father Htyaruh said he feels that he is there to serve all the people of his Waterloo church. “Now I am here, serving the community in the Sacred Heart Parish, not only to the Burmese people, but also the native (born) people too,” he said. Just like Father Aidoo, Father Htyaruh said he has felt incredibly welcomed by the people of the Archdiocese of Dubuque. “I was warmly welcomed by the community. I am happy to be with this community, it is a beautiful community,” he said. Father Htyaruh is scheduled to remain with the people of Sacred Heart for a total of five years before he will return to Myanmar.